A gamer, typist or keyboard enthusiast enjoys customizing their keyboard almost as much as using it. With many different companies, the choices are vast. 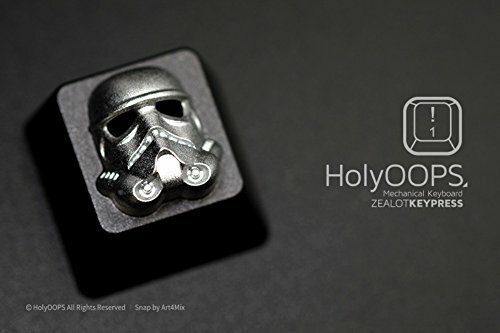 You can choose a complete new keyset for your keyboard, a few keycaps to make certain keys stand out, or even a customized Star Wars keycap by HolyOOPS. 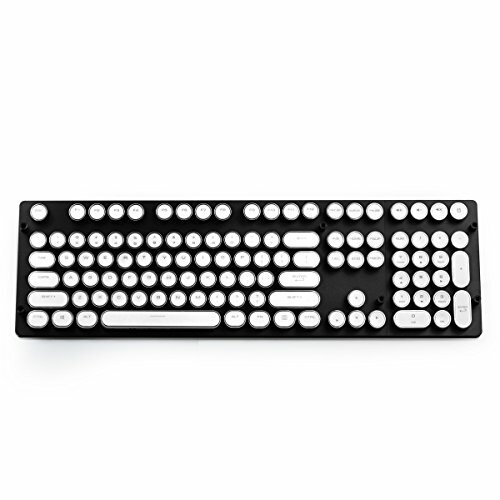 For use with mechanical keyboards, particularly those with Cherry MX switches, custom keycaps are used to completely redesign a keyboard or to make it easier to see keys that are used most often. Available in many different colors, symbols, and shapes, custom keycaps are designed using ABS or PBT plastic. One company uses high-quality rubber to design their keycaps, and another company adds an aluminum coating. The lettering or symbols are available in printed, etched, or double-shot. Double-shot molding increases the life of letters, numbers, and symbols by helping prevent fading. There are a few things to consider before purchasing a new set of keycaps. We have put together this guide in hopes of helping you decide on features that are important to you. We have also reviewed 10 custom keycap sets varying from a whole set to that one particular keycap some simply cannot live without. We hope you find this custom keycap buying guide helpful in your search. 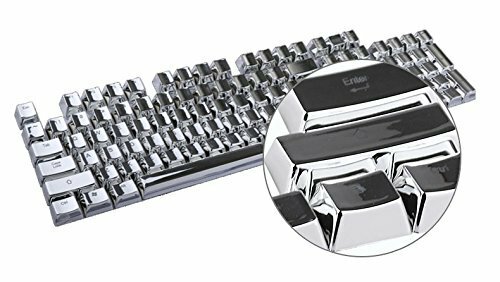 E-Element offers a complete set of 104 silver keycaps that can update your mechanical keyboard with a futuristic look. 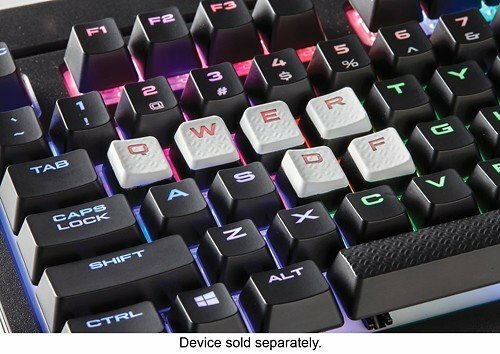 Made of PBT plastic, the keycaps have a vacuum electroplating surface and are double-shot molded ensuring the lettering will last longer. The keycaps are translucent allowing your backlighting to add more special effects. These keycaps are compatible with Cherry MX, Khail, Gateron, and Outemu switches. A key puller is included allowing you to easily change out the keycaps. This is a great set for anyone wanting to completely redesign their mechanical keyboard. AGPtek offers 8 zinc alloy keycaps for the letters W, A, S, D, and 4 symbols. These keycaps are compatible with all mechanical keyboards with Cherry MX switches. Labeled on the side of the keycaps R1-R4 for height, you can easily replace your old keycaps to customize your keyboard. R1 keycaps are for the letters Z, X, C, V, B, N, M, and the numbers 1, 2, and 3 on the number pad. They can also be used for WASD keys and direction keys. R2 is sized for letters A, S, D, F, G, H, J, K, L, or numbers 4, 5, and 6 on the number pad. R3 fits the letters Q, W, E, R, T, Y, U, I, O, P, keypad numbers 7, 8, 9, and the delete, end, or page down keys. Last, the R4 size keycap fits the escape key, function keys, print, scroll, pause, number lock, tab, shift, CTR, ALT, WIN, backspace, enter, and the top row of numbers. RUNSTAR offers 9 orange keycaps made of PBT high-quality plastic. The dual-injected keycaps are translucent allowing backlighting to shine through perfectly. Compatible with all Cherry MX switch keyboards, these keys fit WASD, escape, and the arrow keys. The included keycap puller is made of PBT high-quality plastic as well. HolyOOPS offers customized keycaps that are a gamer’s dream. With triple anodized aluminum, these keycaps are translucent making them even more eye-catching. These textured custom keycaps fit all Cherry MX switches. Available in size R4, your new keycap will customize your escape, function keys, print, scroll lock, pause, or number lock. 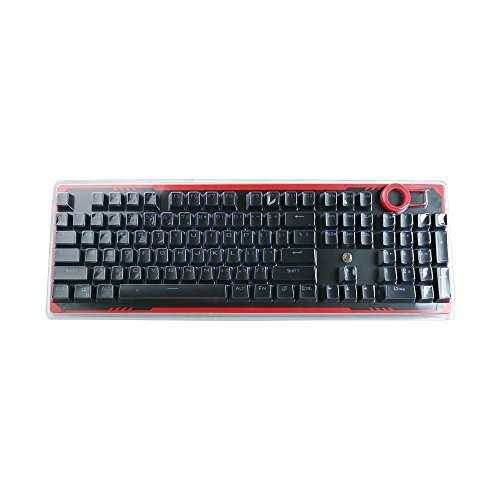 Detailed designs ready to enhance your keyboard include 3D Ironman, Agents of Shield, Arc Reactor, Captain America, Fried Egg, Hammer of Thor, Resident Evil, Run Forrest Run, Star Wars, and V for Vendetta. 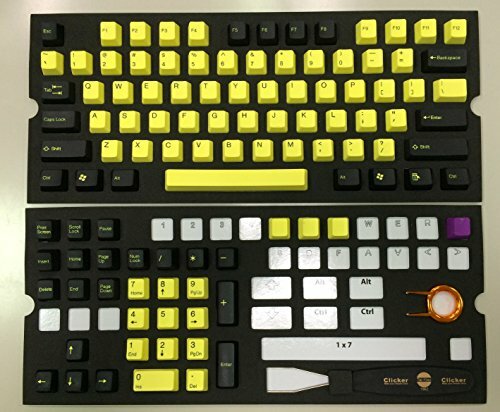 Taihao offers a custom keycap set of 105 bumblebee yellow keycaps. They are designed with double-shot injected molding for lasting letters, symbols, and numbers. 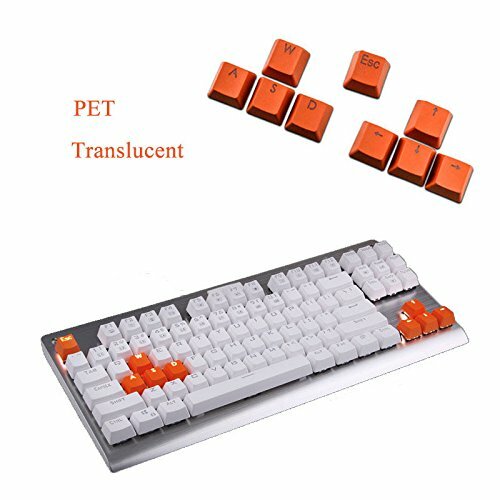 Made of PBT high-quality plastic, these keycaps are compatible with Cherry MX, Khail, and Gateron mechanical keyboards. A keycap puller is also included. The bright color makes it easier to use in dimly lit areas. Corsair offers this white keycap set that is compatible with all Corsair mechanical keyboards and any keyboard with Cherry MX switches. The caps have a textured feel and you will receive the letters Q, W, R, D, E, F, A, S, D, and W. Two W and D keycaps are included with one each angled right and the other angled left. This keycap set also includes a key puller. This set is certain to help create a customized keyboard anyone would be happy to use. Rosewill offers an 18 keycap set made of rubber that gives them a textured feel. The letters include Q, W, E, R, A, S, D, F, 4 arrow keys, and the numbers 1, 2, 3, 4, 5, and 6. The keycaps are translucent allowing backlighting to show through, and they are designed for mechanical keyboards with Cherry MX switches. This set is available in green, purple, and sky blue. A keycap puller is also included. Qisan offers a complete keycap set that will give your keyboard a vintage look with a typewriter feel. The included 108 keycaps are made of ASB plastic and are double-injected to prevent fading. The keycaps are white trimmed in gold, and are also available in black trimmed in silver. This set is a US layout and the keycaps have a soft texture feel. Tesoro offers this set of keycaps with aluminum coating to create a unique look for your keyboard. The keycaps included are Escape and the WASD keys. It’s an excellent keycap set for FPS gamers. This set has a very different font than most keycaps offered and is compatible with all Cherry MX switch or equivalent keyboards. A keycap puller is included, and it all arrives in a stylish gift box. Redragon is a familiar namebrand for most gamers. 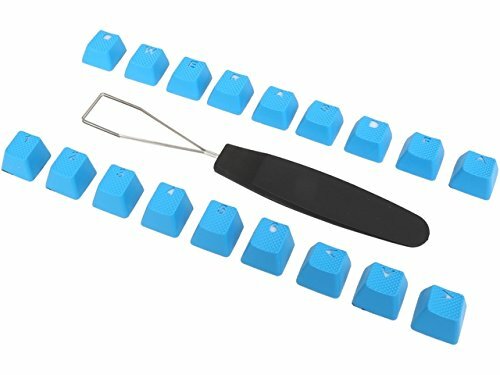 They offer a complete set of 104 keycaps with double-shot injected molding to prevent fading. Made of ABS high-quality plastic, these keycaps are also translucent allowing backlighting to shine through. The black keycaps have large easy to read letters, numbers, and symbols that are 100% anti-ghosting. Redragon designed this set for Cherry MX switches, but it will fit most mechanical keyboards. Compatibility – The majority of custom keycaps are designed to fit keyboards with Cherry MX switch keys. However, several keycaps will fit other mechanical keyboards. Be sure to read the product description before purchase. Keycap Material – Most keycaps are made of high-quality ABS or PBT plastic. We did review a rubber keycap set, and some have zinc alloy incorporated into the design to help prevent fading. Translucent – Not all keycaps will allow backlighting to shine through. If this is an important feature to you, be sure to check the product description. A Whole Keycap Set or Just a Few – Many companies offer a keycap set to completely redesign your keyboard. Others may offer anywhere from 1 custom keycap to 18 keycaps. Character Key – Some gamers and keyboard enthusiasts love the idea of one custom keycap to stand out among the others. Custom designs include symbols for Ironman, Agents of Shield, Hammer of Thor, Resident Evil, and more. Key Puller – A key puller is a must-have tool when switching out keycaps. It’s always a bonus when one is included in the set. Font – Although they may come in a different color, a lot of custom keycaps have a similar font to what we are used to. A few use a larger size making the letters easier to read. There is also one keycap set we reviewed that has a large completely different font on the keycaps. Color – You can pretty much find any color keycap, but not all colors are offered by the same company. Keep in mind the color of your backlighting when choosing a color also as the backlighting colors will affect the look of your new keycaps. We hope you have enjoyed our custom keycap buying guide and reviews. Our best advice is to decide which features you are looking for, narrow down the choices that fit your criteria, and then read as much as possible about each set before purchasing. We wish you the best of luck finding the perfect keycaps to customize your keyboard.